Industrial Helix wrote: OK, it looks like the court is the biggest problem. What if the numbers alternate top to bottom? But there needs to be some sort of resolution for this. yes, I suppose we could alternate them.... it will be a petty though. Try putting some space in between them. What if you flip the layout from rows to columns? That is, instead of having the king in the first row, the counsellors in the second, and the nobles in the third, put the king in a column at the left, the counsellors in a central column with their numbers still beneath them, and the nobles in a column on the right, again with their numbers beneath them but with the column staggered from the counsellors so that their numbers can run to the right without covering the numbers for the nobles. ender516 wrote: What if you flip the layout from rows to columns? That is, instead of having the king in the first row, the counsellors in the second, and the nobles in the third, put the king in a column at the left, the counsellors in a central column with their numbers still beneath them, and the nobles in a column on the right, again with their numbers beneath them but with the column staggered from the counsellors so that their numbers can run to the right without covering the numbers for the nobles. I was not aware of that. I'll ask chip if he prefers it that way, since he'll be doing the XML. I've added an extra pixel between army numbers. I think it could work now. This is the worst scenario, we'll rarely see those slots so full and all in the same colour. I still worry that once the troop numbers in the court go to four digits (which is perhaps unlikely unless one is using the colour codes), the overlap will be annoying. What if the king were in the centre, the Counsellors formed a ring with four sectors around him, and the nobles formed a ring of eight sectors around that? With the sectors at various angles, overlap would be unlikely. Hey, the whole court could be depicted as charges on a heraldic shield, hmm? Just throwing that out there. A wording suggestion for the Castle legend: "can 1w assault the governing family member"
Yeah I thought it might be tight. What you can do is remove the word "army". It's redundant in most cases. I think you should keep the word army in the castle+knight column where it says, "1 army, 1 extra army for each 2 additional knights". But in the other places if you put +1 auto, or +1 auto-d that will fit in every spot and will be understood easier. What do you think about my suggestion Kabanellas? ender516 wrote: I still worry that once the troop numbers in the court go to four digits (which is perhaps unlikely unless one is using the colour codes), the overlap will be annoying. What if the king were in the centre, the Counsellors formed a ring with four sectors around him, and the nobles formed a ring of eight sectors around that? With the sectors at various angles, overlap would be unlikely. That will mess all the space for legend letters... I'd rather go for the alternate top to bottom number scheme. Though that when that rare situation happens one could (and should) always play in the large map. A wording suggestion for the Castle legend: "can 1w assault the governingfamily member"
Amazing project. I'll try to come later with concerns/suggestions. I'd say the court looks like it meets the criteria that we needed to see for this map to get out of the pot and into the fire. Neutral army starters will be the key element here. -Castles would start with 3 armies. So a player in the initial round would have 3 + 3 auto-deploy + 3 region bonus (there will be no region bonuses in this map but I think we’ll have those minimum 3 troops– right?) making a total of 9 armies to use on the first round. -Catapults would be protected by 6 neutral armies – they give a fairly reasonable income of 2 armies, though they come in auto-deploy mode and with limited options to use. We also need to make this value high to avoid initial 1st round bombardments via trebuchets on other castles. 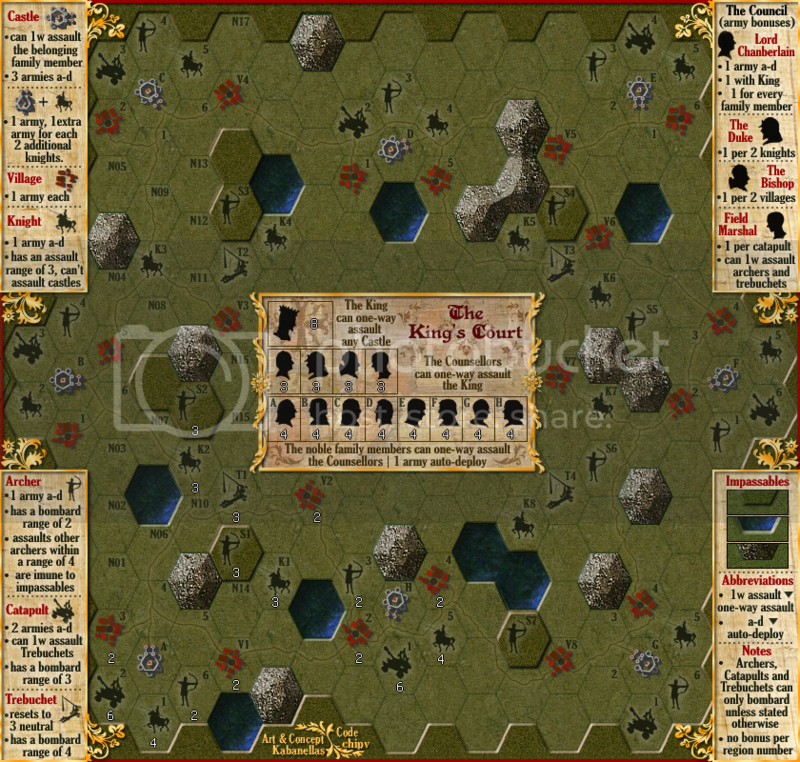 -Cluster Knights would start with 4 neutral armies – good income of 1 free army (Knight + Castle) + 1 in auto-deploy mode and a very good ability of assaulting in a range of 3. All other knights would start with 3 neutral armies. -Cluster Archers would start with 2 neutral armies – 1 army in auto-deploy mode in a region that can only bombard apart from assaulting other archers in a range of 4. All other archers in-between Castles would start with 3 neutral armies. 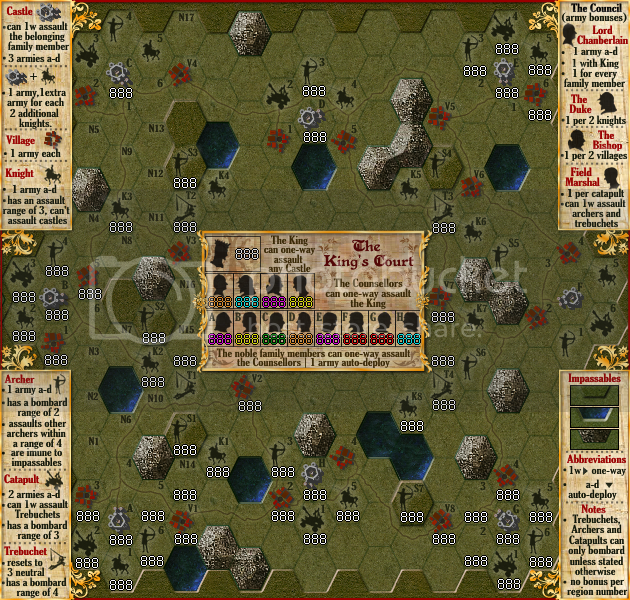 -Villages – the only straight free-to-use bonus shouldn’t have more than 2 neutral troops to kill. All other regions would have 1 neutral army on them. All Noble family members would start with 4 neutral troops though they will only give a +1 auto-deploy army. But I do prefer to enlarge this value to 4 and reduce the value of the Counselors to 3. This way the second player wouldn’t benefit immensely from the first one taking down a big bunch of neutral armies there. In your map key for Catapults it says, "can 1w assualt Trebuchets." Did you intend the for the Catapult to one way assault any Trebuchet or just the closest one? Last edited by mattattam on Tue Jun 15, 2010 2:58 pm, edited 2 times in total. Any Trebuchet. In this way with your catapults production you can reach any castle. It will only last for one turn though, because Trebuchets are killer neutrals. Alrighty, if it's any Trebuchet I suggest saying, "can 1w assualt any Trebuchet". I think this clarifies it a bit more and should fit. Also I want to clarify about the Archers. It says they can assault archers up to a range of 4 and are immune to impassables. So can you count the range of 4 by jumping from one side of an impassable hexagon to any other side of that hexagon? Therefor, can the castle A6 archer assault castle H3 archer? Or can the castle G6 archer assault the S6 archer? How do the impassables work here? I don't get what this means. I see 4 Trebuchets. Is only one of them going start at 3 neutral armies? Or do you mean that once you take any Trebuchet it will return to 1 instead of 3 at the start of your next turn? mattattam wrote: Alrighty, if it's any Trebuchet I suggest saying, "can 1w assualt any Trebuchet". I think this clarifies it a bit more and should fit. Yes, that's exactly how Archers work. Though in that case, I've already noticed that I'll have to rearrange those castle archers so they won't get into direct contact. I don't want an archer from one castle having direct contact with another from a neighbouring castle. I was just trying to explain that all territories named by N## will start with 1 neutral troop. Trebuchets will revert to the same 3 neutral killers. Yeah I didn't think you wanted archers to be able to attack other archers at adjacent castles. Gotcha. I thought the second line was relating to the Trebuchets. Last edited by mattattam on Wed Jun 16, 2010 12:25 am, edited 1 time in total. I think it might be an interesting twist to have the archers not immune to impassables, actually. chipv wrote: I think it might be an interesting twist to have the archers not immune to impassables, actually. What if you have the archers immune to green impassables only? This would make it so you don't have to change around any archers and they can still have access to the archers on the raised green impassables. It's like archers can not shoot across the large lakes and rock field impassables, but they can shoot up and down the green hills. That's more realistic too. In the map key you can put "immune to green impassables," instead of, "are immune to impassables".